What happens to children’s minds and bodies when parents cut out meat, dairy, and eggs. Can kids be vegan and be healthy? Of course they can. But parents and caregivers who choose veganism for their kids have a lot of extra work to do. On Wednesday, the Wall Street Journal profiled a preschool in Jersey City, New Jersey, that serves only vegan food to its 1- to 6-year-old students. Apparently, these kids eschew chicken nuggets and pizza for mushroom lasagna and miso soup. In addition to pondering how, exactly, the school achieves this feat, I couldn’t help but wonder: Can kids actually get the nutrients they need on a vegan diet? They can—but it’s really hard. Unless caregivers are knowledgeable and conscientious, vegan kids can develop nutritional deficiencies that affect their growth and development. As the website for the American Academy of Pediatrics puts it, “nutritional balance is very difficult to achieve if dairy products and eggs are completely eliminated.” And even when requirements are met, vegan kids still tend to be a little shorter and leaner than their animal-eating counterparts. First and foremost, it can be hard for vegan kids to get enough calories. That’s not because little Sammy would rather starve than eat a bulgur walnut loaf (although my kids might); it’s because plant foods are bulky and can have a low caloric density, causing vegans to feel full on less. A 2014 study found that vegans eat 12 percent fewer calories than vegetarians and 20 percent fewer calories than meat-eaters. A lower caloric intake may not be a problem for adults, but active kids need sufficient calories to grow and develop. A very active 6-year-old boy, for instance, may need as many as 2,000 calories a day. Another major issue is protein. Proteins are involved in pretty much every biological process—according to the National Institutes of Health, they “are required for the structure, function, and regulation of the body’s tissues and organs”—so it’s crucial for kids to get enough. Protein is made up of amino acids, some of which are called “essential” because the body requires them for survival but can’t make them. Most animal-based foods contain all of the essential amino acids, but many plant-based foods either contain only small amounts of each or lack some entirely—which makes it important for vegans to eat a wide variety of plant-based foods within a single day. Yeah, right. I might be able to get my kids to survive on a plant-based diet, but add “a wide variety” as a requirement and I’m laughing all the way to the butcher. 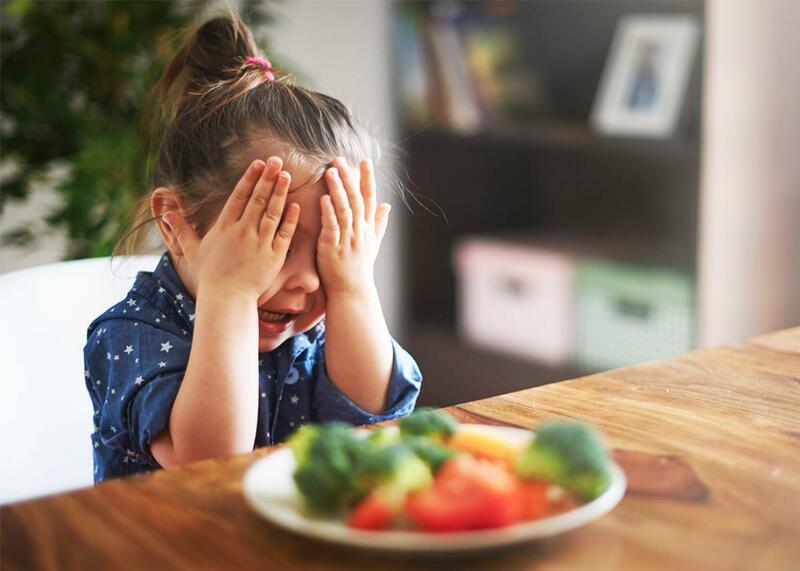 There’s a reason that many kids prefer to eat the same simple foods over and over again: They have “food neophobia,” or a fear of trying unfamiliar foods. It’s likely an evolutionary relic that prevented our young ancestors from accidentally eating poisonous plants when they began to forage. Perhaps since poisonous plants also tend to be bitter, children also dislike bitter foods, such as dark green vegetables, far more than adults do. I’d bet money my 4-year-old would rather eat a crayon than a Brussels sprout. Adding to the problem, research has found that when adults pressure kids to eat certain foods, kids tend to resist them even more. Vitamin B12 is another important consideration. Whereas meats, dairy products, and eggs are B12-rich, plant foods aren’t, so vegan kids can easily get too little of it. This is potentially a big problem, as deficiency can lead to anemia and serious neurological problems. One study found that kids who had been vegans before the age of 6 and were marginally deficient in vitamin B12 during this period displayed cognitive problems as teenagers, including deficits in abstract thinking, reasoning, spatial ability, and short-term memory when compared with teens who had not been B12-deficient. More serious deficiency during infancy has been tied to poor brain growth and developmental regression. Vegans may struggle to consume enough iron and fat, too, which are also important for growing brains. The iron found in plant-based foods is called non-heme, and it is more poorly absorbed by the body than the heme iron found in animal products; plant chemicals called phytates can further reduce absorption. Research suggests that iron deficiency anemia during childhood “results in long-term, and potentially permanent, neurobehavioral impairments.” Moreover, vegan kids tend to eat less fat than nonvegan kids do, and as I explained in a previous column, fat—especially the omega-3 fats found in fatty fish— is important for brain development, too. There’s also the question of what happens when caregivers restrict children from eating certain foods. If a child chooses to be vegan, that’s one thing. But when adults do the deciding, kids may assign greater value to the banned foods and then sneak (and overeat) them when they get the chance. In a 2007 study, researchers brought 5- and 6-year-olds into a room one at a time and placed bowls of yellow snacks and red snacks in front of them. They told the kids that they could eat as much as they wanted of the yellows but that they couldn’t eat any reds. Later, they lifted the ban, telling the kids that they could eat as much as they wanted of both snacks. For comparison, a second group of kids was offered the two options without any restrictions. When the researchers analyzed how much of each snack the kids ate, they found that those who couldn’t eat the red ones at first subsequently ate a whole lot more of the reds than the yellows, whereas kids who weren’t given restrictions ate about the same amounts of each. Interestingly, too, kids in the study whose parents were highly restrictive about access to food at home consumed more total calories than kids whose parents were only moderately restrictive. Similar findings were observed in a study conducted in 2008. These findings suggest that when kids get their hands on food they’ve been banned from eating, they eat more of it—and they suggest that strict food restrictions may incite kids to eat more in general. It makes sense: Anyone who’s ever tried the Atkins diet knows that the first thing you reach for when it’s over is a doughnut. Or eight. Can kids be vegan and be healthy? Of course they can. Fruits, vegetables, and whole grains are undoubtedly good for growing bodies, and research even suggests an association between veganism and a reduced risk for cancer. But parents and caregivers who choose veganism for their kids have a lot of extra work to do as they have to ensure that their children are getting the calories and wide variety of nutrients they need—not a small feat when dealing with typically fussy, food-neophobic kids. Forcing food restrictions on kids could also backfire, causing them to binge on the very things they’re told to avoid. I wouldn’t be surprised if at least one of the children at that Jersey City preschool is sneaking nibbles of string cheese at recess.